I’ve never been the type of girl with tons and tons of shoes. I typically keep one pair of flats, one pair of functional heels, something formal, and wear them until they’re torn up. Shoes never registered as accessories to me until I found this pair of Rampage Wrecker boots. I took a chance on these on several levels. They were the first shoes I’ve purchased online, which can be hard when you’re a half size (depending on the brand, I can fit into size 8, 8.5, or 9). On top of that, cowboy boots can be hard to incorporate into an otherwise classic wardrobe. But alas, I can’t resist a good sale— or free shipping— and when I found these on 6PM for $21, I didn’t think twice. Plus, I justified the purchase by adding in some plain black flats since my pair had worn down. Since the Wreckers stop above the ankle, they’re a lot more versatile than your typical pair of tall cowboy boots. I typically wear them with leggings, or I’ll roll up the cuff on my jeans to define my ankles and elongate my legs. While they don’t make a loud statement, they still add attitude to an ensemble. The studs add a contemporary rocker feel, too. They pull simple clothing combos– like a sweater and skinny jeans– together into an actual outfit. One of my goals lately has been to experiment with my personal style. These boots were a way to dip my toe into something new. Of course, now that I’m starting to appreciate the importance of shoes to an outfit, I want to go out and spend mucho dinero on more… but my lack of storage space keeps me in check (thank goodness). But, I am inspired to start stepping outside of my comfort zone and start curating my closet with clothes and accessories that express more of my personality. 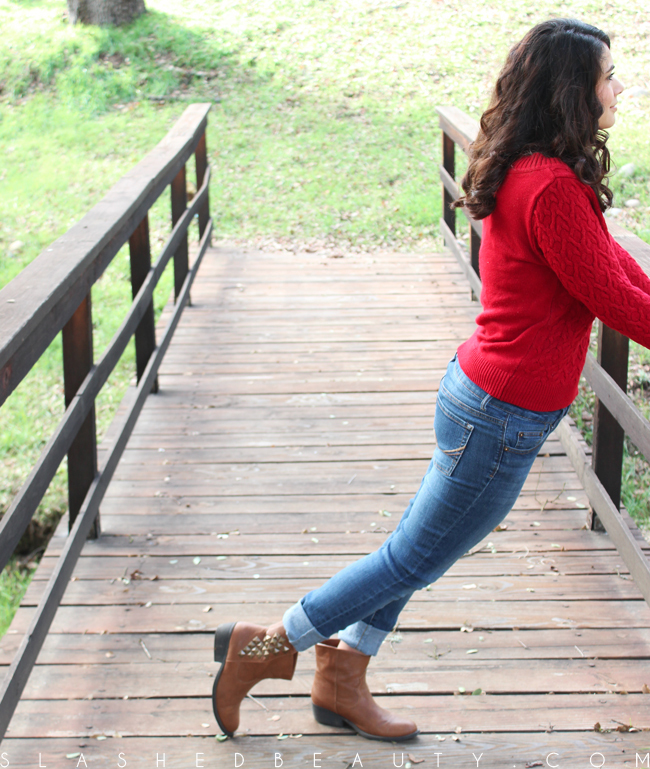 Those boots are cute, those jeans are everything, I love you hair and I love these photossss! They surprisingly are! I can wear them and walk around all day with no problem. those boots are so cute! totes adorbz. I love shoes, but instead of collecting for style, I collect for comfort! Comfort is a must have, even when I search for fashionable items! Those boots are cute! My style is cute casual with a little bit of funk. You look cute in those boots. 6PM has some nice items so you just reminded me to revisit that online store! Those are cute! I love the studs. As Stevie Nicks says ‘I’d wear my boots year-round’! I would describe my personal style is quirky with edge. Love those boots! That is a great deal on your new boots. I love getting a good bargain on a great new accessory. I love these! Super cute on you! 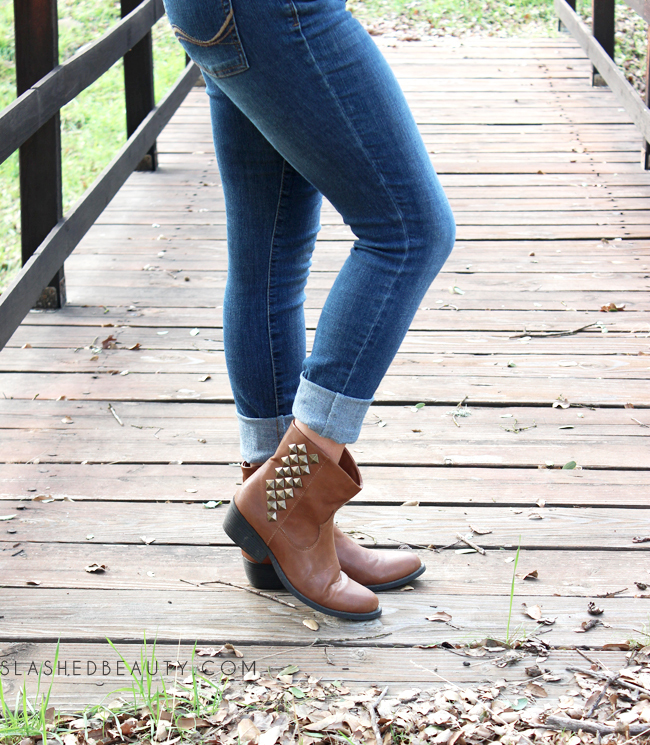 These are a cute twist on the cowboy boot. They’re really cute! The stud detailing is perfect. These boots are so cute! Love the studs.